If superhero roleplaying has an OD&D, it is 1978's Superhero 2044. Written by Donald Saxman and published by Gamescience (yes, that Gamescience), there's no denying that Superhero 2044 is an odd game by most measures. (It's also worth noting here, before someone comes along to correct me that this RPG is actually a revision and expansion of an earlier game, Superhero '44, published the previous year) First and most obviously, Superhero 2044 is set in the future, in the middle of the 21st century on the fictitious island nation of Inguria. Thanks to the havoc wrought by the Six-Day War earlier in the century, as well as its being home to a variety of high-tech industries (including spaceflight), Inguria is the pre-eminent world power and home to a large number of superheroes. I have to admit I find the future history of Superhero 2044 more than a little wacky, but superheroes are themselves fairly wacky, so I don't think this is necessarily a flaw in the game. Indeed, I find something rather charming about this central conceit of the game, which, to my mind at least, hearkens back to the beginnings of comics, when superheroes patrolled the streets of imaginary locales like Gotham or Metropolis. Furthermore, by placing the game in the future, it provides a better foundation on which to construct all the super-science and aliens that most supposedly "modern day" comics have in abundance and yet never seem to change the world in any noticeable fashion. Inguria and the world it inhabits, on the other hand, are changed by the presence of these things, a fact that I think makes a setting like this a good one for a roleplaying game, even if it's not what many gamers might expect. Character creation uses a point-buy system that was unusual for its time. 140 points are used to purchase attributes (there are seven), as modified by the character's "type." Superhero 2044 presents three types of characters: uniques ("possessing powers and abilities far beyond those of mortal men" -- think Superman), toolmasters (think Iron Man), and ubermenschen (think Tarzan). Up to 50 points may be allocated toward a character's super powers and related abilities. However, there are no rules or descriptions of super powers. This was done consciously by Donald Saxman "for copyright reasons," which is bizarre from both a legal and a game design perspective. Instead, it's left to each player, in cooperation with the referee, to model a character's super powers so that they work with the game's various systems, particularly combat. Now, I am sure that many readers will, at this point, be shaking their heads in disbelief and that's understandable. I had the same reaction when I first read Superhero 2044. And while I can't completely defend Saxman's choice as a wholly logical one, I think it needs to be taken in context. For one, as I'll explain shortly, Superhero 2044 is a very abstract game. When I compared it to OD&D, I wasn't kidding. The game is only a couple of steps removed from a mere simulation; its explicit roleplaying elements are inchoate. For another, it was commonplace in the early days to leave many aspects of a game up to individual players and referees to design for themselves. I'll grant that a superhero game that considers super powers something best left to be designed on the fly is a bit peculiar, but I don't think it's as absurd as it appears at first blush, even if it's not an approach that I myself have much interest in. I call Superhero 2044 "abstract," because, as written anyway, it's more about simulating the daily lives of superheroes than it is about specific adventures. Characters go "on patrol," seeking out crimes to thwart and villains to defeat. The results of a patrol depend on a number of factors, most importantly the area the player chooses for his character to investigate. There are many tables that take these factors into account to generate a situation and its results. Thus, a character might come across an attempted assassination of a public figure or an act of terrorism or even shoplifting. The choices a player makes influence the dice rolls that determine the outcome of patrols. Rules are even included for solo play, so that a player can take his hero on patrol without the need of a referee. As one might expect in a system like this, combat is similarly abstract, being mostly another factor that adds to the determination of what happens while a character is on patrol. I think it's the abstractness of Superhero 2044 that is its biggest drawback when viewed from the present day. As I said above, the game seems more like a simulation of superheroics than a roleplaying game about superheroes. There's a decidedly wargame-y quality to it all, a quality that overwhelms its innovative and clever ideas and likely goes a long way toward explaining why, despite being the first superhero RPG, was never its most popular. 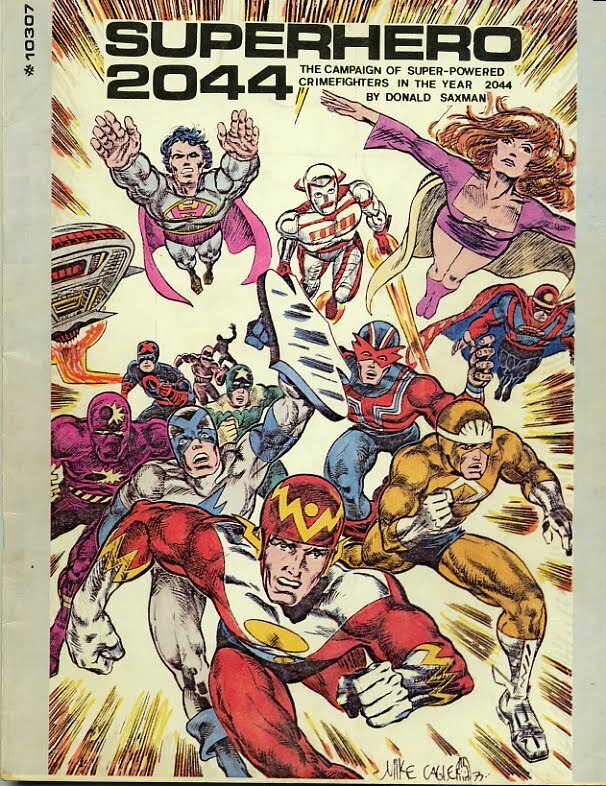 In fact, I'd hazard a guess that most gamers have never even heard of Superhero 2044, let alone played it. I never heard of it myself back in the day and it was only in recent years that I saw a copy. I've never had the chance to play it and, while I find many aspects of it intriguing, I can't say that I have much desire to inflict it on my gaming group. Still, it's worth remembering this game and its contributions to the early hobby. Without it, Villains & Vigilantes and Champions (both of which, I have little doubt, were influenced by Superhero 2044's design) might have been very different, as might the entire history of superhero gaming. I ran this as a sort of postal game back in the eighties. The tables were perfect for generating events and so on. I owned this when I was a kid. It weirdly has a nostalgic softspot that I can't figure out. I never played it. couldn't figure out how you would, but did in fact like the patrol idea for some reason. Perhaps it's similarity to En Garde? But I wonder if it biased me against supers games. Other than one session of Champions, I don't recall ever playing any supers games. Did the feeling of getting ripped off by Superhero 2044 ruin them for me? The best superheroes game I've played was Palladium's Heroes Unlimited, with a GURPS heroes game a close second. I hear there's a really, really amazing game out there, but I can't remember what it was called, not for the life of me. @Dave - Wild Talents? Godlike? The abstract nature and "random encounter" structure are intriguing. @Dave Cesarano: I don't know if it's the game of which you're thinking, but With Great Power... is, hands down, the best superhero game I've ever played. The rules strongly promote the telling of a four-color comic book story. I've never heard of this one. Weird, I'm usually very into nostalgic gaming so I figured I would have stumbled on it at some point. I always dug the cover and to think if they just simply added powers and rules to flesh out characters, it might of been a success. But they didn't and other people came in and picked up the torch that was dropped. In an interview I did with Saxman some years back, he indicated that the game was more inspired by En Garde than it was by D&D. Obviously it was a late comer compared with Superhero 2044, but did anyone else play GW's abortive superhero RPG Golden Heroes back in the day? It was admittedly flawed, but still pretty cool. My favorite thing about it was that combat worked in terms of comic book frames, so that you were invited to imagine all of your hero's actions literally laid out on a comic book page. Also, the art was really groovy. @Bob: I'm not surprised about En Garde as I thought of it while reading James' description. Which is odd given I've owned both (although En Garde years after Superhero 2044). I did own this back in the day and it thoroughly confused me. Not so much the make-up the powers part (although I was like 'huh'). It was more "but what do I do" with the patrol tables. I was trying to figure out how this related to comic books. To give you an idea how confused, I figured Superman was an ubermenschen. My touchstone for comics was Superboy and the Legend of Superheroes and I got most of them as uniques. Toolmasters I got as Batman. Superhero 2044 is good game for solo-play, given the patrol mechanic. Something similar turned up in one of the old DC Heroes Batman modules, so the concept of patrol play obviously had legs for another decade, at least. Golden Heroes was reincarnated a few years ago as Squadron UK. Alright, it is missing the art from some of the UK's finest comic artists (I miss Brian Bolland), but it is still the same game and just as much fun. I loved this game and we played it constantly when I was a kid. As far as I know, none of us who played it even owned the rulebook - all we had were photocopies of the character generation and equipment lists. I've played or run every Superhero RPG ever published prior to 2007 or so and even some made after (finally got to play B.A.S.H. last month) with the exception of this one. Well, we tried to play it but for the life of us couldn't figure out how. While the game came out in '78 my group and I wouldn't discover it until 82 or 83 and by then we were hip deep in Villains & Vigilantes(See note below). When we looked at a copy of Superhero 2044 that had been given to a friend of mine we simply stood perplexed and aghast at the thing. While being very creative folk us gamers, when given something that abstract at the age of 12-13 we just as soon leave it for a game that the writers, y'know, finished making. At least that's how we thought of it. I distinctly recall one of my friends asking where the powers were and other telling him there were none. We need to make a list of powers ourselves. One fellow said, "Maybe we could use the list from V&V." To which the first guy replied, "Maybe we coud just keep using V&V." And there went our experience with Superhero 2044. @Ben L.- We played and liked Golden Heroes, though it was a losing battle to get us to play it over V&V or Champions (especially Champions). You can download an updated variant on the internet for free under the title 'Squadron UK'. A superhero RPG without superpowers is like... D&D without magic!! "Villains & Vigilantes" was better to play, but was very D&D (it is not a bad thing, but it isn't very original). Is it possible to play a competitive, multi-player game of this like En Garde? I'll always stand by DC Heroes as being the best superhero game I ever played. On the topic of Gamescience, I could tell you some stories about Lou Zocchi having worked for his ex-wife, briefly dated their daughter, and shopped at his gaming warehouse on numerous occasions, knowing and gaming with some of his employees, and then actually finding out after the fact that I was friends with one of the kids from Gulfport High who pulled off a big job of stealing a whole bunch of game books in the mid 90's and selling them at school. They got busted for it but the story of the whole thing is actually pretty funny. I had no idea until years later that growing up on the Gulf Coast had so much to do with the history of gaming. It was quite an experience now that I look back upon it. I'm sure that having a huge Air Force base had something to do with the huge explosion of geek culture in the area. I started with Champions, back when it was just a blue staple bound book. At some point I got an issue of some magazine (I think it may have been Spacegamer) that had an adventure for Superhero 2044. I remember running it with Champions (can't remember if it was dual statted or I just adapted it). At any rate, it gave just enough taste for the odd setting of S2044 to intrigue me, but I never did run across a copy of the actual game. On the subject of making up the rules for your powers, I remember later when we experimented with V&V that there were a number of powers listed that when you looked them up basically said "you and the GM figure out how this works." It was quite jarring to my Champions trained sensibilities! I played this when it came out...it was a bit clunky and I discarded it for the far easier SUPERWORLD, which I stuck with over V&V and Champions.